Want to donate to our class? Check out what books we'd like for our classroom library. Cassia is a 17-year-old girl living in a society that is based on probability. It's community members do not get a whole lot of choices in life, including the person they will marry and have a family with. Instead, they are matched with an individual from a neighboring town, based on their likes/dislikes/hobbies/etc. At Cassia's matching ceremony, she ends of being matched with her best friend Xander, a boy she has known most of her life. It's already a rarity that she's been matched with someone in her own town, but also someone she knows and loves, and Cassia thinks she's the luckiest girl in the world. That is, until, she sees someone else's face on her match card...an accident? Or her real, true match for life? What follows is an exciting adventure of love and what it means to give yourself to someone fully. There is definitely a feeling of romance throughout the story, but subtle romance, which was really nice for a change. I was excited to turn each page and wasn't able to put the book down until I found out what happened with Cassia, Xander, and Ky. 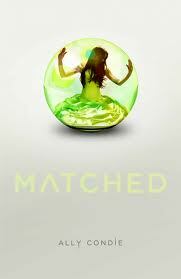 I am a huge fan of dystopian stories and Matched will definitely be ranking high on my favorites list of 2010...I loveed it! One of the blurbs on the front of the ARC I was sent compares the story to a blend of The Hunger Games and The Giver, definitely a good way to describe it. A nice mixture of high tension and that utopian/dysopian vibe so many of us love.I would hand this one to teens that enjoyed either of the two above mentioned books or anything else dystopian. If they're a fan of romance or love triangles, this would also fit that bill. Definitely an exciting page-turner with a nice bit of the romantic. When 18-year-old Kelsey takes a job with a circus, she finds herself oddly attracted to the white tiger she has been hired to feed. Little does she know the animal is really a 300-year-old Indian prince who has been cursed and transformed by an evil wizard. She soon discovers the truth and, to her amazement, learns she may be the only one who can help. 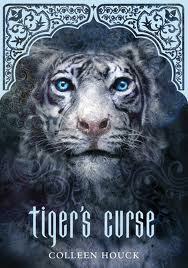 The next thing she knows, she is on her way, with the tiger, to India, where they embark on a dangerous quest to break the curse. The tiger can change into a man for 24 minutes during each 24-hour period. And what a man! “He’s like James Bond, Antonio Banderas, and Brad Pitt all rolled into one,” Kelsey thinks. Originally self-published as an e-book, Houck’s first novel is part Twilight, part Indiana Jones, and part fairy tale. Although her book—the first in a proposed series—is sometimes derivative, she tells a good story filled with chaste romance that will keep readers turning pages to the inconclusive ending. Grades 7-12.